Pros: Great value for an entry-level laptop. Cons: No bluetooth. No touchscreen. According to Toshiba, the C50 laptop series offers everything a budget-conscious user could ask for: basic power, portability and performance - all at a great price. We couldn't agree more with their comment. Toshiba C55-A5182 comes with all the necessary features that an everyday user would need. With it's Intel Core i3 processor, 6GB of memory and 750GB storage space, users will have enough storage and processing power to carry out daily basic tasks. It is great for web browsing, video calling, emailing and entertainment. A touchscreen would have made it even better, however the laptop comes with a standard 15.6 inch non-touchscreen display. The body of the laptop is made of plastic but looks stylish because of the satin black color finish. Performance - Toshiba C55-A5182 is powered by 2.4GHz Intel Core i3-4000M processor. The processor was released by Intel late in 2013, so it is a fairly new processor. Due to Hyperthreading technology, the two cores can handle up to four threads in parallel. However, the processor doesn't support Turbo Boost technology, which dynamically increases the processor's speed as needed. 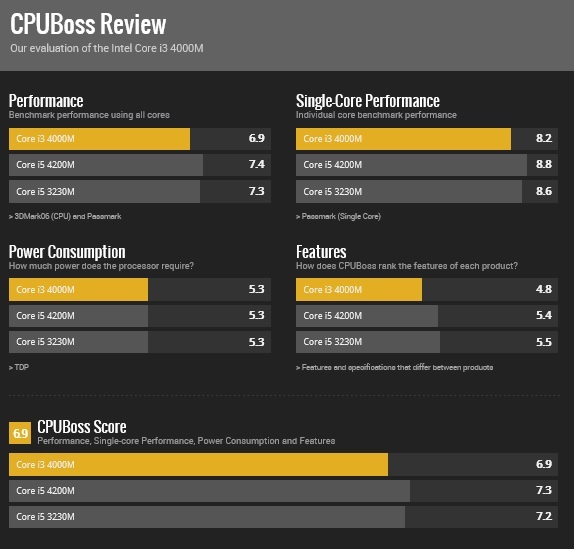 In terms of power consumption, the processor is as good as Intel Core i5-4200M and Intel Core i5-3230M processor, however it doesn't fare that well in terms of performance (see chart below - source: CPUBoss). The Toshiba C55-A5182 is primarily targeted towards entry-level and budget users carrying out light processing tasks. For this, the i3 processor is sufficient. Storage & Memory - The laptop comes with 6GB DDR3 of memory (expandable up to 16GB) and 750GB (5400RPM) of storage space. The memory and storage space is a little bit more than what you would find in an average multimedia laptop, thereby ensuring good multi-tasking with the ability to store all your multimedia files and documents. Display, Graphics & Sound - Toshiba C55-A5182 features a 15.6 inch widescreen HD TruBrite display with 16:9 cinematic aspect ratio and 1366x768 resolution. The laptop comes with integrated Intel Mobile HD 4600 Graphics. While it's performance might satisfy occasional gamers, it is not suited for more demanding games. For smooth frame rates in all games, users may need to decrease resolution and details to a minimum. The built-in stereo speakers with DTS sound enhances the viewing and gaming experience. Battery - The 6-cell lithium ion battery provides a battery life of up to 3.5 hours. Operating System - Windows 8.1. Click here for a closer look and buyer reviews. Toshiba C55-A5182 features a 10/100 Ethernet port and a 802.11b/g/n wireless network card that can connect users to any wireless network. In addition, the laptop comes with a memory card reader, DVD-SuperMulti drive, 3 USB ports (1 USB 3.0 port and 2 USB 2.0 ports) and a HDMI port for connecting to a HD TV. The built-in HD webcam and microphone makes it easy for video calls and live chats with friends and family. The laptop measures 14 x 13 x 1.20 inches and weighs 5.4 pounds. If you're after an entry-level laptop and don't require the latest features and technology available, then we think Toshiba C55-A5182 is a great choice. The laptop lacks some features such as touchscreen and bluetooth capability but it is still suitable for carrying out light processing and multimedia tasks. To sum it up, Toshiba C55-A5182 is an excellent budget priced laptop with basic features which makes it suitable for most users. For a laptop with faster performance, check out our review of Toshiba Satellite S55-A5176.